The Lion & The Lamb B&B Our records show that this inn is closed. Joy In The Morning Our records show that this inn is closed. Homestay Our records show that this inn is closed. Cedar Rapids bed and breakfast travel guide for romantic, historic and adventure b&b's. 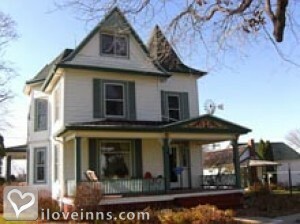 Browse through the iLoveInns.com database of Cedar Rapids, Iowa bed and breakfasts and country inns to find detailed listings that include room rates, special deals and area activities. You can click on the 'check rates and availability' button to contact the innkeeper. When it comes to an Iowa city that offers a lot of things to do and sights to see, the city of Cedar Rapids comes first on the list. With a wild mix of art, culture, dining, nightlife, sports, recreation, shopping, and other recreational opportunities, the city of Cedar Rapids will have something to humor you! The great thing about Cedar Rapids is that it has a balance of modern fun and natural beauty. Home to several parks and trails, Cedar Rapids is the perfect destination for those who want to breathe some fresh air. Just a mere weekend at a Cedar Rapids bed and breakfast will revive you. Have some pure fun or go hiking in Cedar Greenbelt National Recreation Trail and the Cedar River Trail. In Cedar Rapids, you can run, bike, hike, and a whole lot more! By Belmont Hill Victorian B&B.